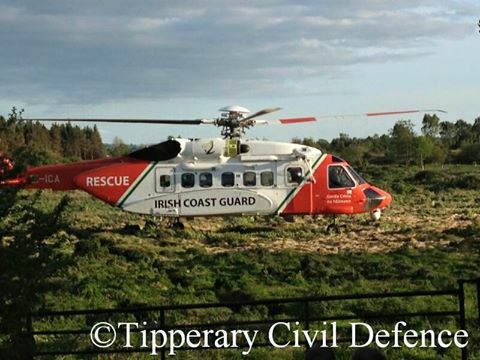 In mid-Tipperary on Sunday evening 14th June the Tipperary North Search & Rescue unit were involved in a successful Multi Agency Medivac with the Irish Coast Guard helicopter, Rescue 115 from Shannon, the National Ambulance Service and Tipperary Fire & Rescue Service. 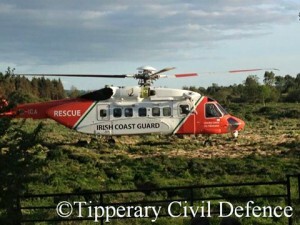 The specialist Civil Defence 4×4 Ambulance was utilised by Advanced Paramedics on the ground to move the casualty to the Heli Landing Site as the helicopter could not land near the incident location. Civil Defence wish a speedy recovery to the casualty involved.